Eager. Determined. Excited. E ran from Grandma’s car to the front doors of the church. Dressed in her Sunday-go-to-church clothes she stopped long enough to give me a hug and a kiss. “I love you,” could be heard as she headed off to her Sunday School class. I cannot tell E’s story. There are parts of it I don’t know at all. What I do know is that she shows up as an illustration of God’s presence in our community. About the time you question all that you have given yourself to doing in your life’s work, that little voice that says, “I love you,” reinvigorates and quells the doubt. Later she illustrates the sort of energy contained in those small packages. Her adoptive mother, like any mother, wonders that may happen next. What will she say? Grandma is on the edge of her seat too. Frankly I love the disruptive nature of children in a worship service. Playfully they remind us that we are often too serious. And, in a service where we often hide, those little ones break the silence and remind us we are not alone in the world. What a gift! 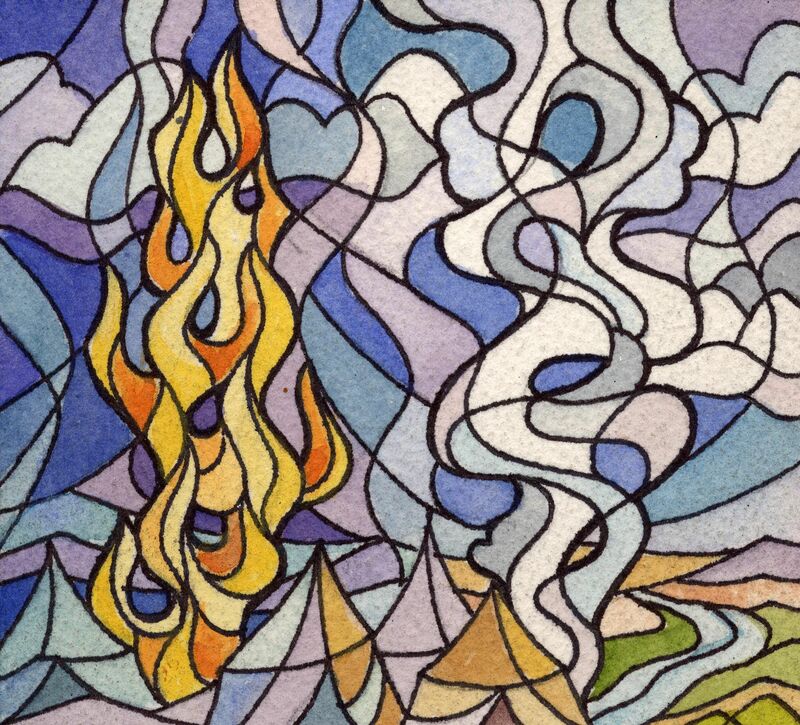 Moses leading Israel comes with the easy signals of God’s presence – a pillar of fire and a cloud. When those symbols become attached to God’s presence it is not hard to discern where to go next. Most of us do not look out at night and see a pillar of fire. When we do we grab a hose. Few, if any, view the clouds around us as leading us except to consider if we need a raincoat. Yet, there was a pivotal moment where even with those easily discernible symbols leading the way Moses pleaded, “Don’t send us from here if you will not go with us.” He goes on to point out that it is God’s presence that provides the distinctive reality that makes of them a witness in the world. We have never really been alone. But, the signs and symbols don’t always keep our attention. If we do not learn how to discern all the ways God shows up as With Us, then it won’t be long before we conclude that we are alone in the world. Social media is both gift and curse. When one of the Grandboys does something at their house their parents may capture it and share it. Recently we watched Max play soccer with a rooster. One of our folks at church thinks me creative enough to use that as a sermon illustration. She suggests I find a way so we will all get a laugh. Who knows? Maybe . . .
On the downside the medium often provides a loss of social graces. Hiding behind the screen many become emboldened. Opinions are formed by bits and pieces. Assumptions are made without foundation and considered truth. Relationships are strained if not fractured. Somewhere in the middle social media becomes the avenue for our projected lives – the life we wish we had. You know, the one we want everyone to think is ours. The split is dangerous. Fitch points out the way our lives exhibit a deep desire, “… to be truly known and to truly know someone. We long to be with someone on a journey that means something. We groan in the depths of the night – groaning for God’s presence.“(p.25) And this he applies even to those in the Church. Fitch does not write to the Church of the past, of say the 1950’s. He writes for a Church that is without doubt facing a different context, at least in North America. Charles Taylor, in his book A Secular Age , argues that we have moved from a day where our world was enchanted by the supernatural. That is, reading ancient literature through to the beginnings of the Modern era, it was assumed there was something beyond this life, beyond what we could see. Religiously this shows up no matter the religion. Think of it as a reference to unseen agents working in the world – gods, angels, demons, spirits. Taylor asserts that the shift in the Modern era is to the assumption that there is nothing beyond the material. We only have what we experience with the senses. It is now assumed there are no gods, angels, demons, spirits. The playing field, Taylor argues, has changed and that has impacted how people understand and respond to conversations about life and faith. Yes, this is an oversimplification of his massive work. The work to be done, Taylor points to, is a re-enchantment of the world. We now know not everything may be explained. The door is open to re-enchant the world. Fitch, I am interpreting here, points to God’s faithful presence in the world through the Church as we sit with the aggrieved, oppressed, marginalized, disenfranchised, the other around the table in fellowship representing the very presence of God. He suggests that we learn to discern God at work in our neighborhoods. Here we point to the reality on which Moses and others relied – God’s faithful presence, The God-With-Us. Maybe this is a means to re-enchant the world. E goes home nearly every Sunday talking about the people she sees and shares life and love with at Church. For her the faithful presence of her teacher, her friends, and yes, even her pastor help her see that she is learning to discern the faithful presence of God even if she may not name it as such yet.